As the Buddha Tönpa Shenrap Miwoché was teaching his disciples, a messenger came to him with a request for help from the deity Sangpo Bumtri. In the land of Öma Jamkya there was an evil minded prince, named Tobu Dödé, that was slaughtering many living beings including humans. The deity Sangpo Bumtri respectfully requested the Buddha’s help to tame the mind of this evil minded prince. As Buddha Tönpa Shenrap accompanied by some of his disciples arrived to help, Tobu Dödé incited his army to rise up and kill all of them. Remaining in his golden chariot, the Buddha emanated rays of light into the four main directions which manifested as flaming, wrathful deities. Each of these deities was dark blue having nine heads, four legs, and eighteen arms each holding a different weapon. Upon seeing these deities, many fainted and Tobu Dödé feared for his life. Falling upon his knees before Buddha Tönpa Shenrap, he begged for mercy and vowed to stop killing and to practice virtue. However, even though the evil minded prince had made a vow and had received teachings from the Buddha, his mind remained filled with hatred and anger. Sometime later, Tobu Dödé fell seriously ill and began to have visions of hell. He cried out for the Buddha to help him and then died. Due to his previous actions, he was reborn into the realm of hell and was tortured. His cries of pain were heard by the Buddha and, due to His great compassion, He descended into hell. Calling out with the mantra “A KAR A ME DU TRI SU NAKPO ZHI ZHI MAL MAL!” both the Lord of death and Tobu Dödé recognized him. The Buddha told him that although the realm of hell was only a manifestation of his own mind, it had now taken form due to his previous karma. The Buddha instructed him regarding the nature of karma and the essence of meditation. When Tobu Dödé’s understanding had changed and his mind developed, even though he continued to be in the realm of hell, the heat and cold no longer harmed him. Meanwhile, the family and companions of Tobu Dödé, fearing for the consequences of their own negative karma after their death, approached the Buddha and asked for his help. In order to teach beings, He invoked the deities and made offerings on behalf of Tobu Dödé. After seven days, he was freed from the realm of hell. However, because his negative karma continued to ripen, he was successively born into each of the realms of cyclic existence. At the same time, Buddha Tönpa Shenrap Miwoche continued to supplicate the deities and make offerings. Being released from the hell realm, Tobu Dödé was reborn into the realm of the hungry ghosts. After seven days, he was released and was reborn into the realm of animals. After seven days, he was released and reborn into the realm of human beings among barbarians. After seven days, he was released and reborn into the realm of the demi-gods. After seven days, he was released and reborn into the realm of the gods. Although the realm of the gods is filled with leisure and happiness, it remains within cyclic existence and is impermanent. However, due to the continued offerings and supplications of the Buddha, Tobu Dödé was reborn as a human being in the purest land of Olmo Lungring. 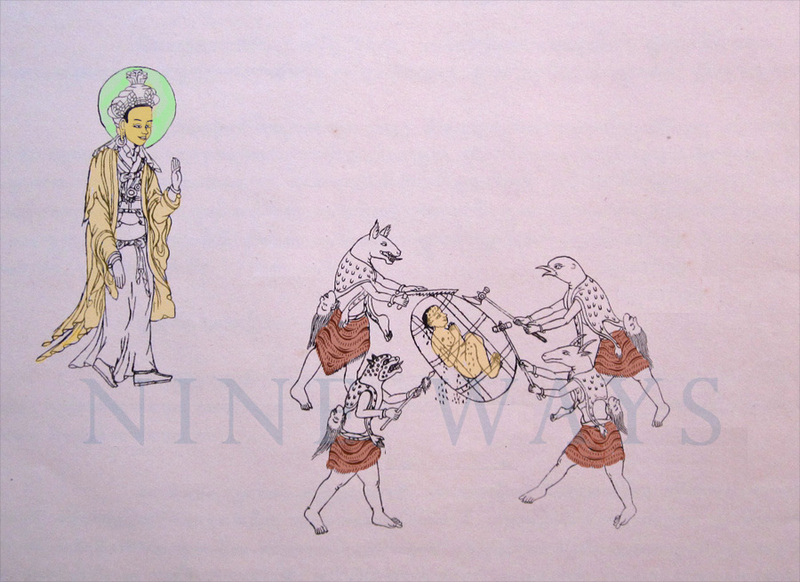 In this way, Buddha Tönpa Shenrap Miwoche showed a method for releasing the suffering of negative karma. Posted on April 15, 2014, in Tonpa Shenrap, Uncategorized and tagged Buddha, Tibetan history, yungdrung bon. Bookmark the permalink. 1 Comment.